The Hundreds Johnson Mid has just released in two new colorways. Both are ankle cut models feature suede two piece uppers set on vulcanized outsoles like original Vans. The two colours are Black/Turquoise and Off White/Black. Oval laces and embossed Jag print set off the clean and simple silhouette. The nice textures and classic body make these a great fall piece. These Vans Era Surfs are super classic and as original as they get. The Lagoon/Cream-Blunt Orange colorway was one of the original model to release in 1967 and its back now 43 years later. 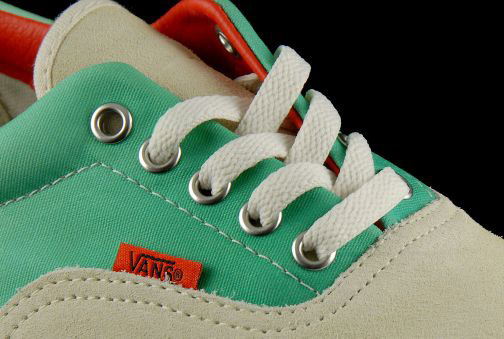 Cream suede is used on the toe, tongue and heel, while Lagoon green leather fills out the upper. Blunt Orange accents can be found throughout, including on the leather liner and sole stripe. Metal eyelets add some additional charm to these classic kicks. Here we have the Van’s Vault Inca Era “Inca Flower”, which feature a mixed textile/leather upper. I’m posting these because I really like the colours as well as the texture/pattern contrast on each show. The light grey version is a nice soft suede while the mocha brown version is a sleek leather. They are now available in two colorways at Proper.